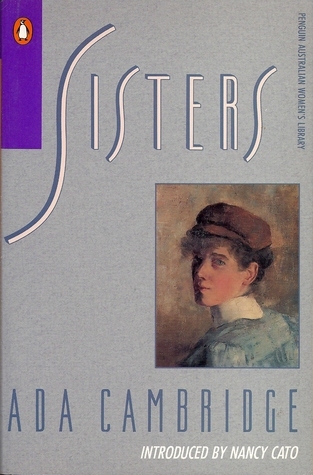 My copy of Sisters by Ada Cambridge (21st November 1844 - 19th July 1926) was a fairly recent find in a second hand book shop. It's a 1989 Penguin Australian Women's Library edition which was apparently the first time this glorious 1904 book had ever been reprinted. With wealth and good birth behind them the four Pennycuik sisters expected to marry well and live happily ever after, but Ada Cambridge, in this turn-of-the-century novel, dispenses with conventional romantic notions about marriage. Deborah Pennycuik refuses three proposals in one day; Mary invents one to last her whole life; Rose marries for love and into poverty; while Francie marries for money. Whatever the motive and how ever careful the choice, marriage is no guarantee of happiness. Instead, Ada Cambridge presents a cutting satire on the institution of marriage. The title appealed immediately as I am also, one of four girls. According to the brief bio in the front of the book, many of Cambridge's 25 novels were serialised in the Australiasian and The Age and she was one of Australia's most successful and best known writers at the time. Really? How is it then, that a review by Ali @Heavenali a few years ago, was the very first time I had ever heard of this extraordinary Australian writer? Where did she go? Why did she fall out of favour? How did she fall out of favour? Ada Cambridge (1844-1926), writer, was born on 21 November 1844 at St Germans, Norfolk, England, daughter of Henry Cambridge, gentleman farmer, and his wife Thomasina, née Emmerson, a doctor's daughter. She grew up in Downham, Norfolk. On 25 April 1870 at Holy Trinity, Ely, she married George Frederick Cross, a curate committed to colonial service; on 19 August they landed in Melbourne. In the following years pastoral work took them to Wangaratta (1870), Yackandandah (1872), Ballan (1875), Coleraine (1877), Bendigo (1883), Beechworth (1885) and Williamstown (1893). 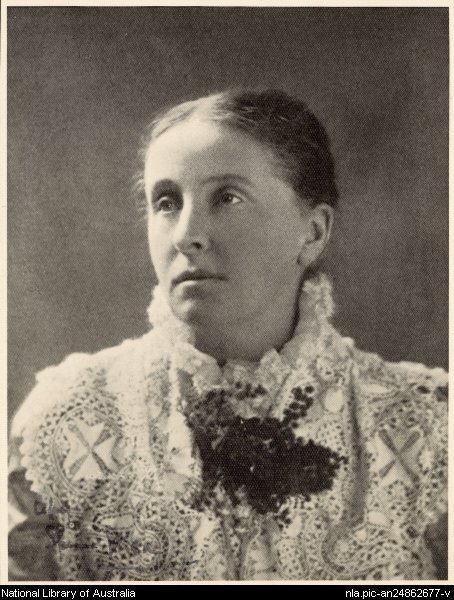 Ada was centred on but not confined by home and family in those decades and the busy life of their different parishes gave her a wide range of colonial experience which she later recalled in the engaging and valuable Thirty Years in Australia (1903). This and her childhood reminiscences, The Retrospect (1912), inspired by a return visit to England in 1908, show to what extent she drew upon personal experience and private dream-world for her novels. She herself emerges as frail and charming, never robust after a carriage accident in the 1870s; her ideas were considered a little daring and even improper for a clergyman's wife. She sounds utterly fascinating. As does her very pragmatic, class-conscious story about marriage. Sisters is the story of four young women coming of age on a rural property in northern Victoria. But it is also the story of Guthrie Carey, a young sailor whose life crosses paths with the sisters at various points. The perils and pitfalls of love and marriage dominate the story. It would seem that Cambridge had a pretty cynical view and very low expectations for happiness within the confines of marriage. Poor Mary married in a fit of madness, an older man beneath her in every way, even though he was a man of the cloth. Her marriage was one of quiet desperation; her only joy an ungrateful son and the eventual death of her husband. Rose, also married beneath her - way beneath her - a draper no less, but she married for love. To the modern reader, it seems like she has a pretty happy marriage. There's enough money to live very comfortably, they appreciate and feel grateful for their good fortune and they have eleven healthy, adoring children! Rose doesn't miss the society life of her childhood, but her sisters still judge her and deem her marriage unsatisfactory due to the taint of 'new money'. Such a sordidly domestic person she was!...Love - great, solemn, immortal Love, passionate and suffering - was a thing unknown to comfortable, commonplace Rose....Was it come to this - that marriage and family were synonymous terms? Frances, pretty and wilful, the baby of the family, shockingly marries a much older man for his money. They quickly head off to the Continent to live the society life deemed necessary back then. Just as quickly, she begins an affair with an old family friend. Poor Francie! she was born at a disadvantage, with that fascinating face of hers set on the foundation of so light a character. Deb, the beauty, stayed defiantly single for most of her life, until she succumbed to the charms of her very first lover in his dotage. She is lonely for children, but consoles herself with some kind of high-minded ideals about pure love. But basically she's left nursing a grumpy, old man! Young Carey's first wife tragically dies in a boating accident after five weeks of married life together. Lily's ghost and their brief marriage becomes his ideal. He falls for the beauty of both Deb and Frances and nearly gets ensnarled in a romantic fantasy gone wrong with Mary. Eventually he marries an English country cousin, after finally attaining everything he ever dreamed of, yet still idealising his love for Lily, instead of being grateful for what he has. Lily in the retrospect was the faultless woman - the ideal wife and love's young dream in one...'Whatever is lacking now, I have known the fullness of love and bliss - that there is such a thing as a perfect union between man and woman, rare as it may be.' It will be remembered that he was married to her, actually, for a period not exceeding five weeks in all. Cambridge finishes her tale about love and marriage with Jim, the station manager, who has secretly pined after Debbie all his life, listening outside the window to her play the piano to her slumbering husband. He did not know what a highly favoured mortal he really was, in that his beautiful love-story was never to be spoiled by a happy ending. A rather twisted version of the 'it's better to have loved than lost, than never to have loved at all' idea perhaps? We have an unhappy marriage with a power imbalance, a domestic goddess whose life is taken up with child bearing and child rearing, an adultress, a nursemaid, a man still in love with his former wife's ghost and a lonely old, man dreaming of a love that will never be! I'm certainly very curious to know more about Cambridge's own marriage now. If Sisters is a fair example of her work, then I will certainly be seeking out more. She doesn't write with the same breadth and depth as Henry Handel Richardson, but she does tackle women's issues and class consciousness head-on in a time when this was not really the done thing in literature. Sisters features some fabulous dialogue and memorable descriptions. Debbie and Carey in particular, are fully realised characters that will live with me for a long time to come. Bill @The Australian Legend is planning an Australian Women Writers Gen 1 Week. Cambridge is considered to be Gen 1 writer according to Bill's list of generations. Pop over to his page to join in the discussion or to check the list for your own reading pleasure. The idea is to read and link up Gen 1 AWW on his post that will go live on the 15th Jan 2018, to create a fabulous online resource for all of us. Bill's post alerted me to the fact that the AWW Gen 1 women, including Cambridge were dismissed by the (mostly male, Sydney-centric) Gen 2 writers. In much the same way that many men still try to dismiss Jane Austen as a romance writer for women, it appears that Cambridge was relegated to the status of being nothing more than a writer for women, writing about female domestic concerns. And therefore not worthy of male attention. Have you ever read any books by Ada Cambridge? Lovely review....I read it twice to let it sink in. De Parny: "Of peace and quiet we sometimes grow weary, But never of loving or being loved"
Due to it's age, I suspect you might find Sisters (& other Cambridge titles) on one of the free classic download sites like Project Gutenberg. What a life! I have not heard of Ada but thx for introducing. Sounds like she was a bit subversive for her day. In a good way, of course.